The organising committee of the 2016 edition of the DHC+ Student Awards received 11 applications coming from Poland, Denmark, Croatia, Germany, France, Austria, Hungary, Spain and the Netherlands. This year’s papers covered a broad spectrum of topics related to district heating and cooling: from large scale heat pumps, solar CHP, hybrid energy networks, thermal energy storage, production and distribution optimisation, installations versus laboratory performance, to the decision support model for competitive district heating. The Student Awards evaluation committee, composed of eight DHC+ representatives from industry and academia, performed a thorough assessment of the submitted 8-page papers. The committee took into consideration the overall importance of the contribution to the science and technology, the methodology and logic of conclusions, clarity and preciseness of presentation, expected market impact and creativity of approach. DHC+ wants to thank all participants for their contribution and encourage them to participate in the future editions of the Student Awards by improving their research on the basis of the feedback received. This year, the evaluation committee decided to reward three top young researchers. 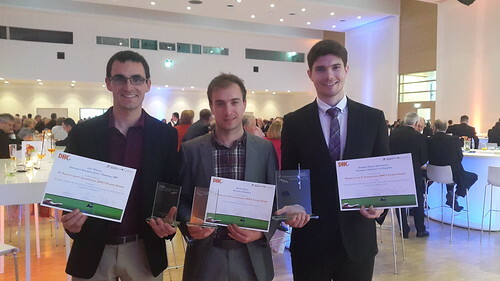 All three winners presented their findings in Frankfurt at the 22nd International Trade Fair and Congress for Heating, Cooling and CHP (En+Eff 2016) during a special “Power to Youth” Session and received their awards from Bertrand Guillemot, Chairman of the DHC+ Technology Platform. Their articles will also be published in the International EuroHeat&Power Magazine.